" We're still repairing the culvert. And then continued with road repair"
The collapsed road and box culvert that located on Jl Manunggal RW 01 Ceger, Cipayung, East Jakarta began to be repaired. The repair is initiated by unloading culvert as long as eight meters with two meters deep. According to Beritajakarta.com, the culvert concrete that located in front of RW 01 Ceger office has been unloaded, likewise with roadside. A number of materials such as sand, stone and cement are stacked around the location. Around the collapsed road, is installed with a bamboo safety thus cannot be passed. Vehicle traffic is rerouted to Jl Remaja that is on the north side. Access towards Jl Maunggal has been closed using a board and a chair plus with a signpost. It is imposed in front of under Jagorawi toll road and in middle of Jl Manunggal near residential. 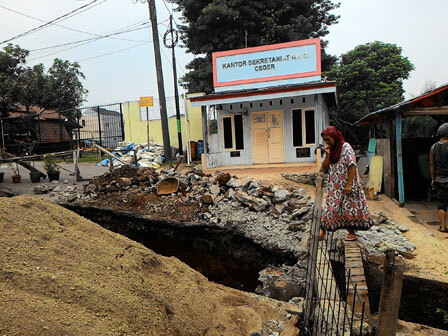 Head of East Jakarta Bina Marga Sub-dept, Ahmad Juani Yusuf disclosed, the initial stage of repair is from culvert. If it was done, the road above would be asphalted. "We're still repairing the culvert. And then continued with road repair," he told, when being confirmed, Monday (5/16). He predicted the repair will take 2-4 weeks ahead. While the culvert will take a long time, considering it should be extracted first.